BookNook — Young Adult book reviews2.5 StarsStrands of Bronze and Gold was written well and certainly had interesting elements, but unfortunately the majority of the book was boring. The problem is that once Sophia arrives at the Abbey, Bernard doesn't let her go anywhere or do anything. As such, 95% of the book takes place in the Abbey. Sophia wanders around, has dinner with Bernard, and explores a little. And 352 pages of that just gets uninteresting really quickly. There are long, drawn out periods where I literally felt like there was no action and no plot development. Sophia slowly learns that Bernard has a temper, but that's the only real sense of development.To some people, Strands of Bronze and Gold might be a creepy read, but I actually wasn't that creeped out by it. Maybe because I'm not a teenager and I have read much creepier adult books? I also feel like the fact that it's advertised as a Bluebeard retelling worked against the book. I wonder if Strands of Bronze and Gold would have been more interesting if I didn't go into it expecting Bernard to be a creepy wife-killer. If I didn't know that from the start, maybe the ending would have been somewhat of a surprise instead of something I anticipated from the very beginning.My other main problem with the book was the insta-love between Sophia and Gideon. Sophia meets another man in the woods (Gideon) and after like two meetings they are already "in love". That was hard for me because Sophia began to cling onto her 'love' for Gideon like a beacon in the darkness of the Abbey, but I couldn't relate to it or appreciate it at all.On the bright side, I did think that Bernard was an interesting character. 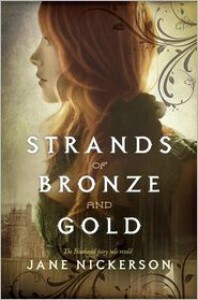 He was easily the most dynamic character in Strands of Bronze and Gold. Since he had a temper, you never quite know which side of him you were going to get. He could be sweet, charming, flirtatious, but also creepy, forward, demanding, controlling, and temperamental. But unfortunately, the dynamic characters stop here. The others were either uninteresting or popped in and out so much that I constantly forgot about them until they temporarily reappeared.But the biggest downside of Strands of Bronze and Gold is just the lack of action. If it wasn't so darn boring, I feel like this could have been a great book. It certainly has beautiful writing and I did like the historical elements of it. There are some connections to slavery and the Underground Railroad that I quite enjoyed reading about. But the fact that not much actually happened in the story is what makes me feel indifferent towards the whole thing. I just had no connection to it. It took me over a week to read it just because it couldn't hold my attention.